The President, who was represented by his Vice, Yemi Osinbajo, said that the construction of the factory demonstrated the robustness of the nation’s economy and expressed the hope that the event would further stimulate growth. He thanked the Nestle Foods Company for pioneering the industrialisation of the rural communities in the country noting that the occasion reflected the importance of Nigeria as an investment destination. The Minister of the FCT, Alhaji Mohammed Bello, who was represented by Mr. Salisu Abdulsalam, said that he was happy that the dream of making Abuja an industrial hub was becoming a reality. He said the facility would provide means of livelihood to the residents of the FCT adding that the territory would remain an investment choice. In a welcome address, the Managing Director of Nestle Nigeria, Mr Dharnesh Gordhon, said that the factory was the company’s third in Nigeria, first major investment in the North, and the most modern water processing factory in Central and West Africa. “It underpins our strong belief in the potential of the local market and the resilience of Nigerian economy in spite of the current difficult and volatile business environment,” he said. 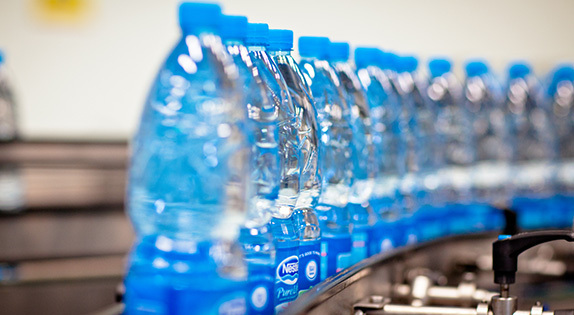 The facility will complement Nestlé Waters’ existing factory at Agbara in Ogun State, and is part of Nestlé’s wider investment plan for sub-Saharan Africa. As well as processing water the new site will be home to a Technical Training Centre for Nigerian engineering students. The company said that as part of its ‘Nestle in Society commitments’, they will provide free access to clean drinking water from taps at the gates of the new factory to an estimated 1,000 local people. The Chairman of the Company’s Board of Directors, Mr David Ifezulike, thanked the Bank of Industry for providing the long term financial support to establish the factory as well as supporting the expansion of the company’s cereal and culinary plants in its Agbara, Ogun, factory. While noting that Nestle factories drove rural development, the chairman said the company was proud to spread the climate of progress to Abaji and leave another notable landmark on FCT industrial landscape. The Execuive Vice President of Nestle S.A., Mr Marco Settembri, said that the organisation was “committed to helping people lead healthier lives as water is surely the best way to fulfill daily hydration needs. He acknowledged the responsibilities facing the company in the new community and promised to ensure better water utilisation and waste management, ensure sustainability of water supply and raising children’s awareness about healthy hydration and water conservation. The Country manager of Nestle, Mr Jason Lambe, observed that the investment of N5.6 billion along with the company’s future investment plans showed its commitment to growing Africa’s largest economy. The Ambassador of Switzerland to Nigeria, Mr Eric Mayoraz, underscored the importance of the economic and diplomatic relations between his country and Nigeria which facilitated the citing of the project. He said Switzerland would continue with its capacity building and education programmes in Nigeria and would offer five new scholarships to Nigerians. Ifeyinwa, please contact Nestle Nigeria directly. thank you. Hello Nnena, Yes you’ll have to contact Nestle directly through their website for employment. Thanks for visiting Beverage Industry News (NG). How do I become a distributor of Nestle water in either FCT or Kogi State? Adamu, thank you for contacting Beverage Industry News. You would need to contact Nestle directly for information on how to become one of their distributors. Pls where does Nestle water have its factory located in osogbo. I go through alot of stress before getting to buy here in Osogbo. still waiting for reply pls. Am an industrial chemist by profession.currently in Abuja.would like to work in your company..How would i go about it.. Please can i register my new E350 space bus with nestle water factory at Abaji ?, for supplying nestle water to customer’s.